Over at the Southern Seminary blog, there is an offer for a FREE PDF download of the guidebook A Guide to Biblical Manhood by Randy Stinson and Dan Dumas. Its authors and the seminary are associated with the Council for Biblical Manhood and Womanhood. Fatherhood requires engaged leadership, but it’s all about serving others. As a result, you have to transition from any role you might have at work where you lead others into a context of service at home. You go home to serve and give yourself a way. Your leadership isn’t toward yourself — it’s always directed toward others. Home is the place where your leadership will be needed around the clock and where your vulnerabilities will be most obvious, but it’s also the place where you have the potential to bear the most fruit as you shape little hearts for eternity. So what does leadership look like for a father and how can you be intentional in shaping your children for heaven? 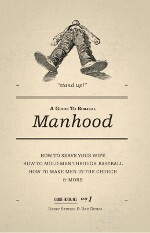 Learn more from the Guide to Biblical Manhood.